In February this year emergency works were performed on the Tower of London foreshore to prevent further undermining of the wall adjacent to Tower Bridge. 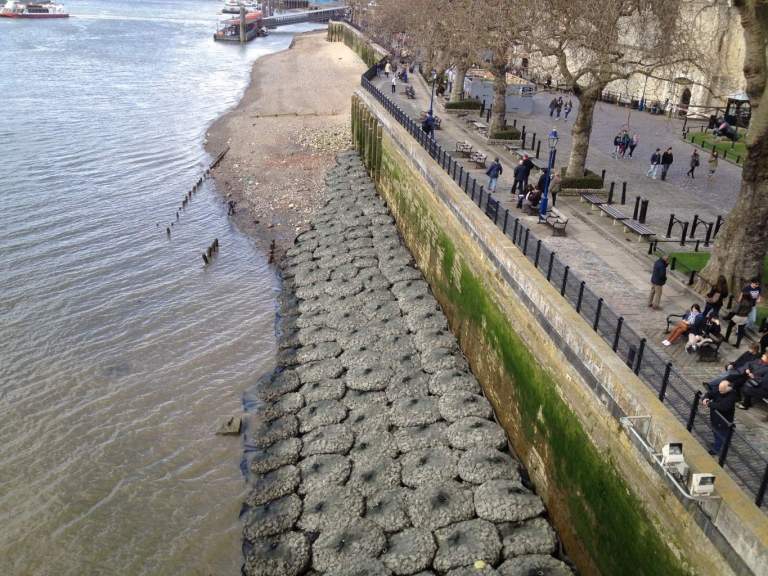 Mackleys Civil Engineering was awarded the contract by the Environment Agency to install over 200 2 tonne Kyowa filter units, known in the UK as Rockbags, as a method of scour protection at the historic site. Designed by experienced consulting engineers Arup, the Rockbags solution was selected as it provided options for possible additional works at the site. As work has not been completed at the site there’s a possibility that the filter units will need to be removed after a short period of time. This was one of the significant advantages of utilising the Units, as the one point lifting ring which remains attached to each bag makes the retrieval process simple and cost effective. The versatility of the Units provided Mackleys with options; either install by barge or use a long reach machine located in the pedestrian area at the top of the wall. As the site attracts thousands of tourists every year it was important that the site was not congested with heavy equipment, and access for pedestrians to the historic sites was still made possible. Mackleys, after conducting rigorous health and safety checks, established that installation could be achieved using a 360 forklift located at the top of the wall lowering the bags into place on the foreshore. Before the Rockbags were installed Ridgeway and Sumisho-Kyowa Ltd were given the opportunity to present the product to the design engineers at Arup which ultimately resulted in the product being specified for the project. Ridgeway supplied the Rockbags to Mackleys Civil Engineering and demonstrated the filling method to the engineering team. Mackleys filled the Units at a quarry located in Kent and transported to site via road, offloading and stock piling in small quantities on site prior to installation on the foreshore.